Consistent with NFPA 101 and NFPA 30, the 2019 edition of NFPA 45 has improved fire safety requirements for new and existing laboratories. 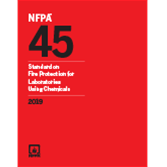 NFPA 45, Standard on Fire Protection for Laboratories Using Chemicals, is the industry's comprehensive source for requirements for the fire safe design and operation of instructional, educational, and industrial laboratories to avoid injury to lab occupants. This standard outlines the maximum allowable quantities of liquids and gases, as well as requirements for laboratory ventilating systems and chemical fume hoods. Revised requirements for exit doors clarify that the methods must comply with NFPA 101® egress requirements. Revised terminology related to flame-resistant clothing aligns with NFPA 2112. Content covering laboratory exhaust ducts, dampers, and exhaust ducting through fire barriers clarifies the installation of exhaust ducts through fire-rated barriers and aligns with the current editions of NFPA 90A and NFPA 91. Language has been added to reference NFPA 30 for quantities of flammable and combustible liquids within inside liquid storage areas, and requirements for gas cylinders are aligned with NFPA 55. Interested in other editions of the NFPA 45? Use the drop down menu above to select the edition year you need. 4.2 Laboratory Unit Fire Hazard Classification. 5.2 Requirements for Life Safety. 5.3 Means of Access to an Exit. 5.4 Furniture, Casework, and Equipment. 6.1 Automatic Fire Extinguishing Systems. 6.2 Standpipe and Hose Systems. 7.5 Duct Construction for Hoods and Local Exhaust Systems. 7.7 Exhausters (Fans), Controls, Velocities, and Discharge. 7.8 Chemical Fume Hood ConstructionRequirements. 7.9 Chemical Fume Hood Location. 7.10 Chemical Fume Hood Fire Protection. 7.11 Inert Atmosphere Glove Boxes. 7.13 Identification of Chemical Fume Hood Systems. 7.14 Inspection, Testing, and Maintenance. 8.4 Waste Handling and Disposal. 9.4 Pressurized Liquid Dispensing Containers (PLDC). 10.1 Compressed and Liquefied Gases in Cylinders. 10.2 Storage and Piping Systems. 10.3 Outdoor Installation of Compressed Gas Cylinders for Servicing Laboratory Work Areas (Located Outside of Laboratory Work Areas). 12.3 Chemical Storage and Handling. Major changes in the 2015 NFPA 45 clarify rules and provide up-to-date fire safety requirements for new and existing laboratories. NFPA 45, Standard on Fire Protection for Laboratories Using Chemicals is the comprehensive source for requirements for the fire safe design and operation of instructional, educational, and industrial laboratories to avoid injury to lab occupants. This Standard outlines the maximum allowable quantities of liquids and gases, as well as requirements for laboratory ventilating systems and chemical fume hoods. An expanded scope and new chapter help protect students and staff in school laboratories. NFPA 45 now applies to all educational and instructional laboratories, independent of the quantity of chemicals present. In response to recent incidents involving injuries to students and faculty, a new chapter on Educational and Instructional Laboratories was added to this edition, with requirements intended to protect people during experiments and demonstrations involving hazardous materials. Other changes in the 2015 edition clarify application and help designers, installers, facility managers, and AHJs comply. By spelling out which chapters in NFPA 45 apply to new and existing facilities, the 2015 edition makes it easier for designers, facility managers, owners, and enforcers to ensure the correct protocols are in place. Other changes impact specific facilities, chemicals, and safety controls. Clarified requirements explain where Class A, B, C, and D laboratory units are permitted below grade. New requirements address fire retardant clothing. New requirements for inert atmosphere glove boxes address the need for equipment to prevent fires caused by air- and water-reactive chemicals. New safe handling requirements are provided for handling pyrophoric reagents and water-reactive material. New safety control rules for open flame operations improve safety by reducing risks to personnel.